Today I want to give you a small update on the topic of hyperpigmentation. If you read my blog regularly you might remember that I am regularly testing products that promise to help against excessive pigmentation and age spots. I had visible brownish pigmentation spots on my forehead beneath the hairline. I also used to have brown spots in between my eyebrows; in summer these overly pigmented patches made my skin – which is generally fairly clear and even-toned – look uneven. Of course the patches were easy to cover up with a bit of concealer or foundation but I still didn’t like the brown spots that much. 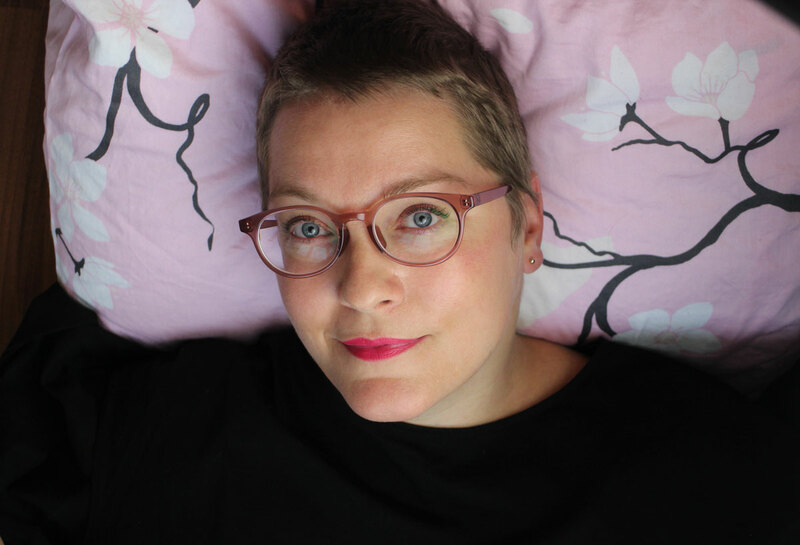 Luckily the pigmentation spot between my eyebrows had already disappeared when I started my blog. This patch of hyperpigmentation came courtesy of a fruit acid peel that I had at a beauty salon back in the 2000s. The beautician who did my peel neglected to tell me about the need for high SPF protection following this kind of face treatment. In addition I used hormone-based birth control back then – an unlucky combination of factors which probably encouraged my skin pigmentation problems. Anyway, the pigmented patches on my forehead appeared a few years later but at least they gave me the opportunity to test many different products against hyperpigmentation and write about them on this blog. Kind of a silver lining, right? 😉 Last summer the brown pigmentation spots on my forehead were still distinctly there although maybe they were a little less visible compared to the year before. In winter-time my brown patches are less obvious than during summer so I sort of stopped paying close attention to the situation – and guess what, two weeks ago I am standing in front of the mirror and all of a sudden I’m wondering what happened to my hyperpigmentation! 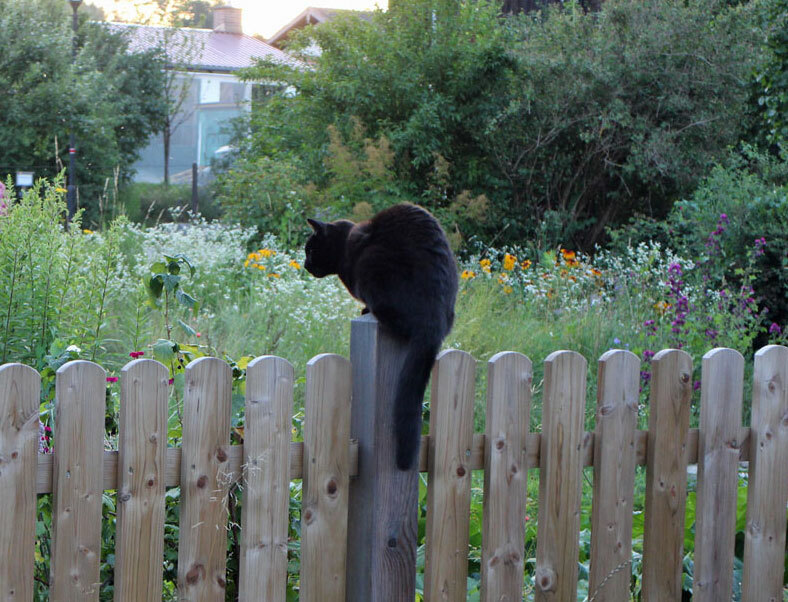 And they haven’t reappered since then (or at least only in a form that is barely visible with the naked eye). At first I couldn’t believe it but now I think it’s rather funny – I’ve tried out so many anti-pigmentation products over the last years and was always a bit annoyed that the brown patches remained on my forehead. And then I completely miss the actual success, i.e. the disappearance of the pigmentation 😉 . This is also why I can’t really say which product, or combination of products, was the one that helped clear up the hyperpigmentation. Or maybe it was just a matter of time? Of course I am very aware of the need for sun protection in summer and I always used a Sun Stick from Evoa or Alga Maris on my pigmented patches, on top of my usual sun screen. I thought I would compile a list of the different skin care strategies that I have developed to deal with my pigmentation problems; perhaps it’ll help one of you readers? I can remember that I used to apply rosehip oil on the brownish skin patches (that was before I started my beauty blog). I had read somewhere that this oil can help regulate pigmentation. Over the last few years I’ve used products that contain ingredients specifically designed to help against hyperpigmentation: Like the aloe vera blossom and aloe vera root extract (in the Age Protect range from German brand Santaverde), liquorice root extract (for example in the Vital Serum Rose Granatapfel from German brand Primavera) and dragon tree resin (for example in the Sérum Eclat Unifiant from French brand Ekia) or niacinamide (in Creme Serum 03 from German brand Calaverna or in the Super Bloom Gel Concentrate from Estonian brand Lumi). In winter-time I occasionally used fruit acid peels, like the AHA Peel Mask from Mádara (Latvia), the Duo Lumière Nectar Bright from Melvita (France) or the Facial Cream Mandelic Acid from Italian brand Fitocose. I also used the Supreme-C Serum Treatment from Danish fresh cosmetics brand Nuori several times as an intensive treatment. Vitamin C isn’t just an antioxidant; when it’s highly concentrated it has a light peeling effect on the skin. I also tried plant-based arbutine from a range of Nordic brands, including the Natural Arbutin Serum from Finnish brand Detria and the Bearberry Oil from Waam (Belgium). So if you’re suffering from hyperpigmentation: don’t despair – sometimes skin problems DO improve with the years. And perhaps you won’t even notice them one day, like I did 😉 . I’m a beauty blogger who travels a lot and loves to try out new products so I’m a big fan of trial sizes and travel sets. 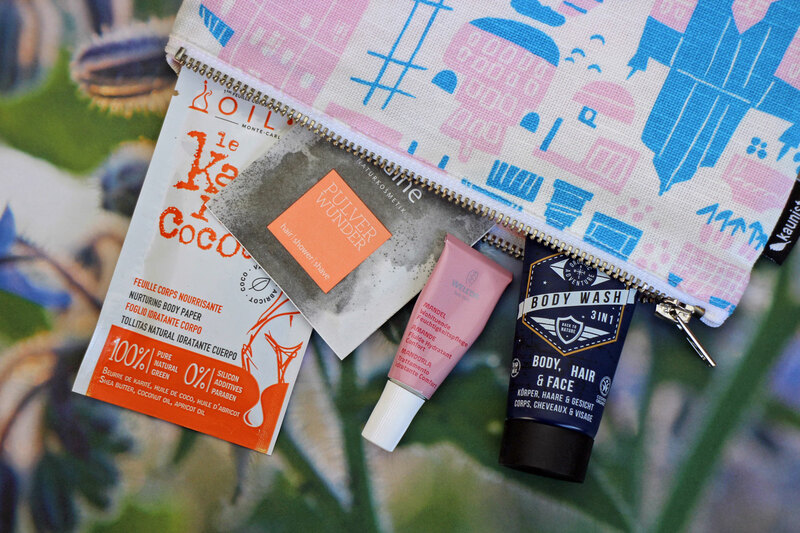 Not only are these mini-sized beauty products compatible with hand luggage restrictions but I can also test cosmetics and make sure the products are a good fit before splurging on a full-size product purchase. Together with my cooperation partner – organic beauty online store Ecco Verde – I’d like to show you a selection of the most interesting, beautiful and exciting organic beauty trial sets that are currently available! „We understand sensitive skin“ is the packaging claim of the Anywhere Essentials Travel Kit from Pai Skincare. All products of the UK brand have been developed especially for very sensitive, reactive and easily reddened skin. The little bag contains travel sizes of the Camellia & Rose Hydrating Cleanser (a super gentle cleansing milk formulated without surfactants), Lotus & Orange Blossom Tonic (a blend of three hydrosols which has an amazing fragrance, even without essential oils) and the Chamomile & Rosehip Calming Day Cream (which has a light, supple texture and is suitable for drier skin types). The kit also includes a muslin cloth which is beautifully soft. The product sizes in the travel set are large enough to last for a week or so – enough time to get to know Pai Skincare a little better (their most famous product is the rosehip oil). 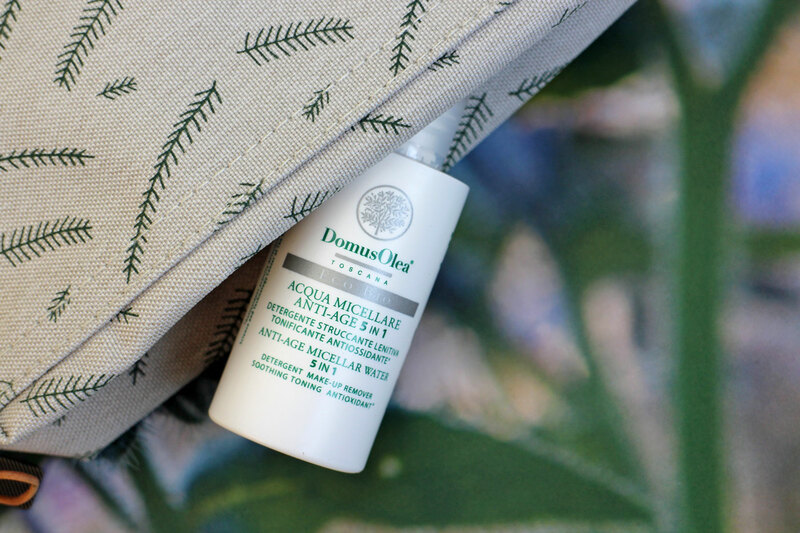 My travel beauty luggage always includes a small bottle of micellar water, like the travel-sized Anti-Age Micellar Water 5in1 from Italian brand Domus Olea. It is a multifunctional product: apply the liquid to a cottonwool pad and use it as a makeup remover (water-proof mascara can be a little tricky but the rest of the makeup disappears quickly). The Micellar Water also works well as a moisturising toner; the third ingredient in the INCI listing is aloe vera. The products of Domus Olea are based on olive ingredients – the Anti-Age Micellar Water, for example, contains antioxidant olive extract. The yellow-greenish micellar water has a soft, powdery-green fragrance. Demeter-certified organic beauty brand Martina Gebhardt offers many of its products in two sizes. This is really practical because it makes the rather heavy milk glass bottles and jars travel-friendly. Also convenient: most of Martina Gebhardt’s cosmetics – the creams in particular – are very rich so you only need a small amount. Take the Happy Aging Cream from Martina Gebhardt, for example: it consists of 50% hydration (spring water, herbal extracts) and 50% lipids (plant oils and waxes) – this, incidentally, mirrors the composition of the hydrolipid layer of a 20 year-old woman’s skin. Since I have slightly dry skin I like to blend a cream with a lotion and two small product sizes (one of each) are perfect for this. The Summer Time Face & Body Lotion with SPF 6 has a much lighter texture and a very light tint which evens out the skin tone without covering it up. 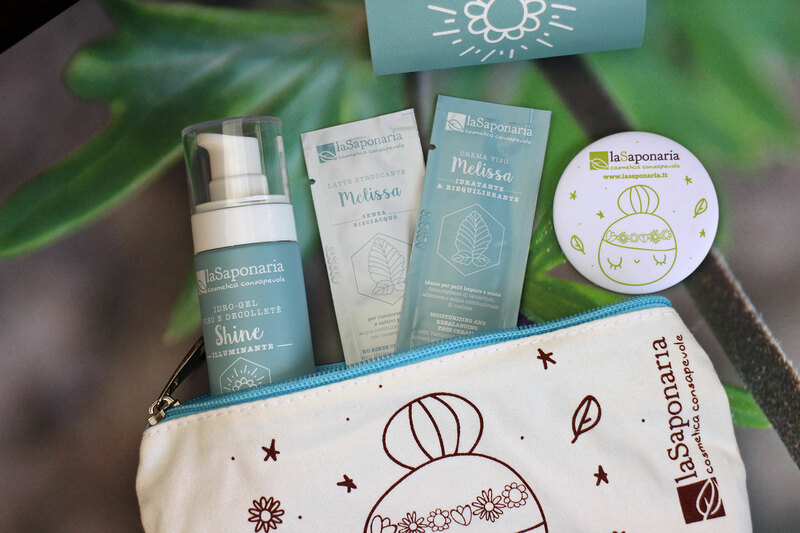 The Skin Care Set for Glowing Skin from Italian brand La Saponaria comes in a pretty little cotton bag and contains an interesting selection of products: there is a small hand mirror, a sachet of the Melissa Cleansing Milk, a sachet of the Moisturising Cream Melissa for Combination Skin and a full-sized tube of the Shine Hydrogel. All three products are based on melissa hydrosol – basically it’s a melissa set! I was impressed by the Melissa Cleansing Milk – it’s surfactant-free but not too rich, with the texture of a fluid. I would definitely repurchase this. Theoretically you don’t have to rinse off the cleansing milk because it is so hydrating (I use a micellar water to remove my eye makeup). The Melissa Moisturising Cream contains rice powder and has a light mattifying effect; I applied it on top of the Shine Hydrogel which is a moisturising gel that leaves a slight shimmer on the skin. This is definitely the Italian Glowy Set in this blog post! Sometimes it’s not easy to find the right foundation shade. Or you might ask yourself why you have to take the same amount of makeup products for a short weekend trip that you would for your annual holiday! 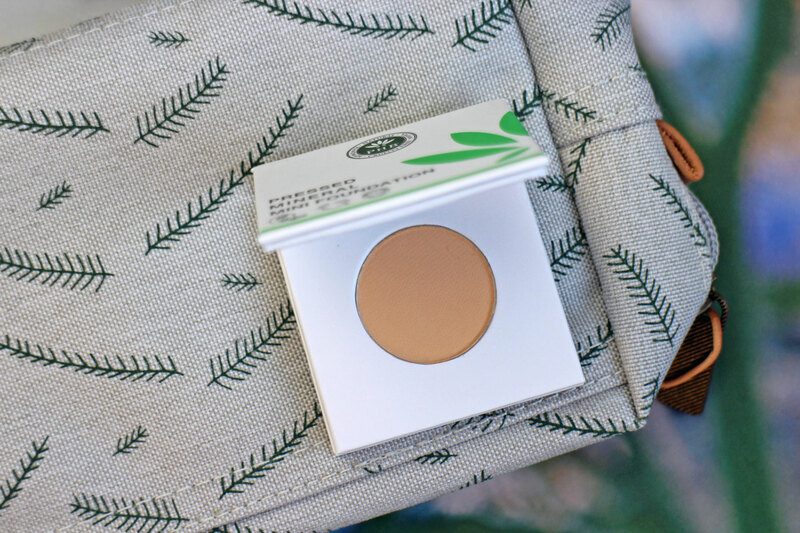 I was therefore very pleased to find out that British-Canadian brand PHB Ethical Beauty is offering a mini size of its Pressed Foundation. The small foundation is packaged in an environmentally-friendly cardboard box and is best applied with a small kabuki brush. The coverage of this mineral foundation is medium, with a satin finish (I need an additional mattifying powder on my T-Zone). The travel foundation is available in six shades; you can see „my“ colour (Fair) in the picture above. The jar of the box is closed with a magnet so the lid stays put and won’t open itself in your makeup bag. Balms or pure shea butter are products that I don’t really use in large amounts. 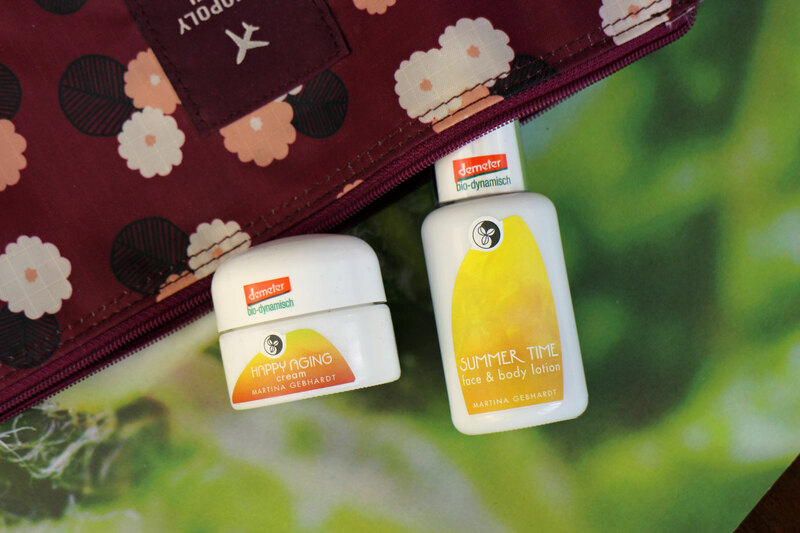 However, I do like to have a small size with me whilst travelling because they are so multifunctional: you can use them on the face or body, on your hair, for hand and nail care, as a lip balm or to moisturise rough skin patches. 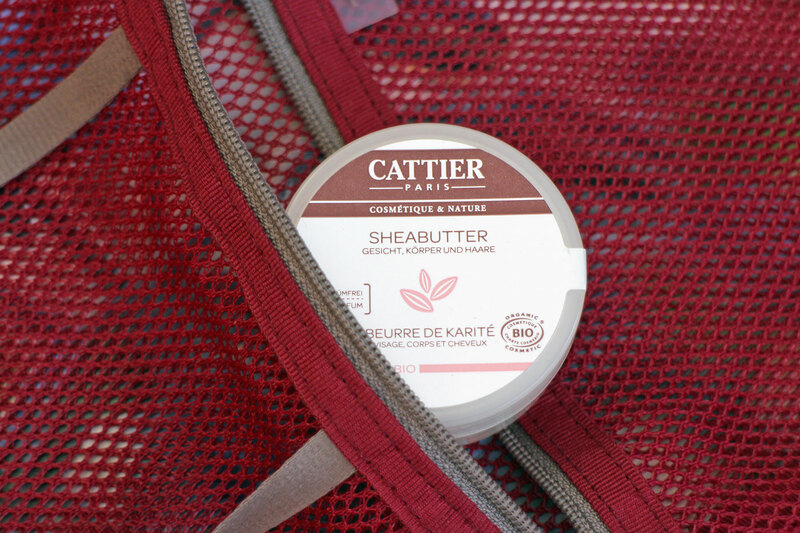 The small jar of Shea Butter from French brand Cattier contains organic shea butter which is unscented and has no perceptible fragrance (so it’s probably deodorised). On warm skin the butter melts immediately; thanks to the stearic and oleic acids it has a strong protective and moisturising effect on the skin. I really like the small product size. 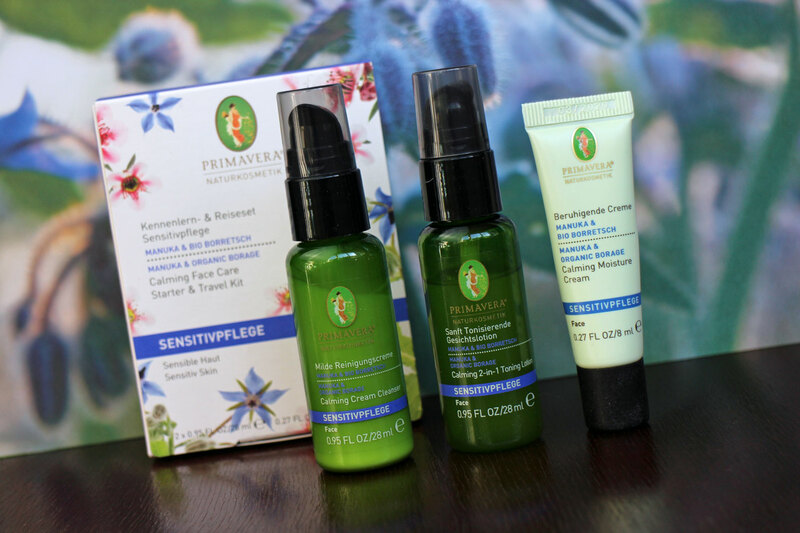 If you want to try out German organic beauty brand Primavera you can choose from different Trial Sets: when I was visiting Primavera’s Allgäu headquarters this May I bought the Starter & Travel Kit Manuka & Organic Borage for Sensitive Skin because the entire product range was reformulated earlier this year. The cardboard box contains trial sizes of the mild cleansing cream, the gentle toning face lotion and the skin-calming cream with manuka honey and borage. This skin care range is recommended for sensitive skin because it soothes redness and strengthens the skin’s own protective barrier. The surfactant-free cleansing milk gently cleanses the skin without drying it out. I particularly like the gel-textured face lotion which reminds me of the hydrating toners/essences from Asia. The cream has a light texture, I used it as a base for my sun protection cream. If you have dry skin you might want to apply a few drops of oil on top of the cream. The cream also contains Centella Asiatica, a plant-based ingredient which has anti-inflammatory properties and regenerates the skin (it is often used in Asian cica creams that are formulated for exzema-prone skin). Vegetables are the focus of Austrian organic beauty brand Hands on Veggies – and you can see this on their trial sizes as well: the packaging is decorated with artichokes, avocados or pumpkins. These vegetables are included as fermented extracts in the Firming Body Mousse, the Hydrating Shower Gel and the Repair & Care Shampoo from Hands on Veggies (the shampoo foams well and contains moisturising proteins). If you want to read more about these interesting ingredients check out my blog post about Hands on Veggies. All of the brand’s products are available in two sizes so you can easily test the products. The small 50 ml tube looks just as pretty as the full size, by the way. The Avocado Shower Gel has a fresh herbal fragrance and the Body Mousse is scented with floral and herbal notes. The fragrances and product textures (which were initially a bit too liquid) have been reformulated since the range was launched. 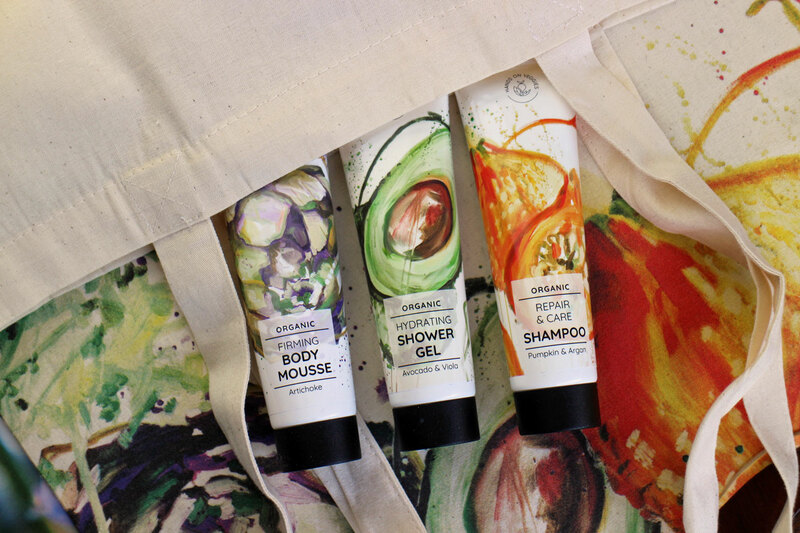 The Hands on Veggies body and hair car range is affordable as well, so give them a go! Every once in a while I buy one of the Mini Sets from Australian brand Antipodes. I particularly like the Moisture Boost Minis Set from Antipodes which includes the Divine Face Oil and the cult cream Vanilla Pod. The facial oil is based on avocado oil (which my skin likes because the lecithin-rich oil transports the moisture very efficiently into the skin) and is scented with a blend of ylang ylang and jasmine. I also like the formula of the Vanilla Pod Day Cream: it contains shea butter, squalane and manuka honey right at the beginning of the INCI declaration. The texture of the cream is neither too heavy nor too light (my skin tends more towards dryness). And even if you don’t like vanilla fragrance you should try out this cream; my nose detects mandarine notes rather than vanilla. One of my favourite protective duos for travels in autumn time! 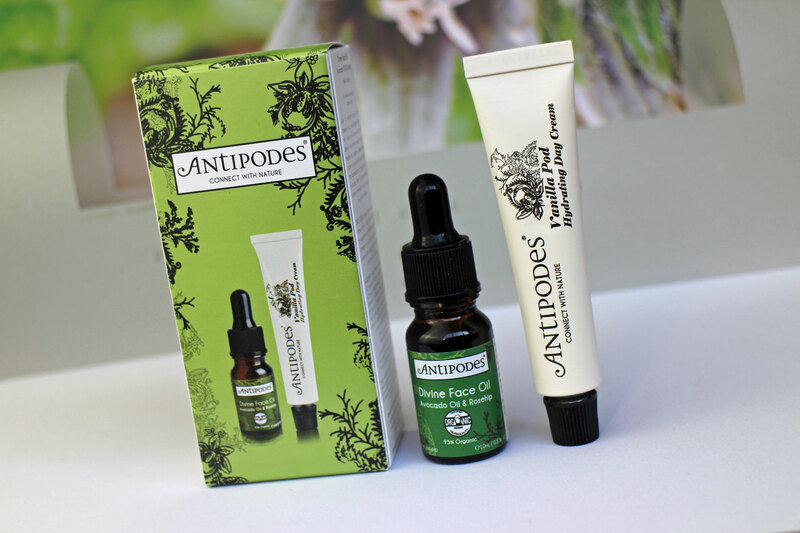 Antipodes also offers two other Mini Sets: Skin Plumping and Anti-Ageing. And here is a mix of convenient individual sachets and small product sizes that I have at home. I take the Lotion Wipes from French brand Oil’a when I’m going on a short trip: the sachet contains an oil-saturated wipe which I use on my body straight after the shower. No oil spills in your hand luggage – guaranteed! If necessary you could even use the wipe to remove your makeup and/or to moisturise your skin. – The Pulverwunder from German brand Plaine cleanses skin and hair (you can also use it for shaving). The individual sachets are compostable and because this is such a multifunctional product it really cuts down on plastic waste at home. The Pulverwunder is now also available in packs of 10 sachets. – I always have a few small sizes of German brand Weleda’s Almond Face Cream at home: the formula of the cream is minimalistic and does not contain fragrance so it’s good as an all-round moisturiser. I do like that Weleda offers so many trial sizes – this makes it very easy to test out new products. –The For Men Only 3in1 Body Wash is from German brand Benecos’s new men’s care range. It’s a combination product that can be used to cleanse face, body and hair and has been formulated with a aromatic, herbal-fresh fragrance. The first week in the South of France has already gone – and strangely enough the landscape that I’m seeing here is much greener than in Germany! Considering the scorching summer temperatures that we’ve had in Western Europe this summer, this reversal (the South of France is usually sun-drenched and dry) is a bit odd. Anyway, the last few days I was in Alès, a small town at the foot of the Cévennes mountain range. BecauseI like to spend my summer holidays in the middle of nature, I rented a small cabin on a quiet camping site. In the evening the cicadas and crickets are singing on the sunny hills around us but unfortunately we also have quite a few mosquitos. On my very first day I visited a local parapharmacie and bought the Anti-Mosquito Duo from Pranarom, a French aromatherapy brand. The two products are both roll-ons, one to fight off the mosquitos, the other to soothe the skin after a sting (this roll-on works particularly well). I was impressed by the beautiful and rather barren landscapes of the Cévennes; I really want to explore this mountain region further. A few weeks ago I bought the Mountain Lavender Hand Cream from Swiss brand Farfalla especially for this trip – because the mountain lavender that is contained in the cream is harvested in the Cévennes. This lavender grows 900m-1800m above sea level and I liked the thought of using a hand cream that was formulated with local wild lavender growing high above my little cabin 😉 . Of course the hand cream doesn’t JUST contain lavender; it is based on water and sunflower oil which means that it is absorbed quickly and is therefore suitable when working at a desk. However, it is even better when you use it at night time, just before going to sleep – the essential oil of this particular type of lavender contains a host of healing and relaxing ingredients. More information is available on the homepage of Farfalla. You can buy the hand cream in stores and online, for example at Naturdrogerie or Najoba. I didn’t wear much makeup this week but I still took the Peach MultEYEtasker from RMS Beauty with me to France because a bit of peach-coloured highlighter on the face is always good 😉 . I like the Living Luminizer from RMS Beauty very much (this product is now also available in pencil form). However, I don’t really understand why the two new pencils both contain silicones. 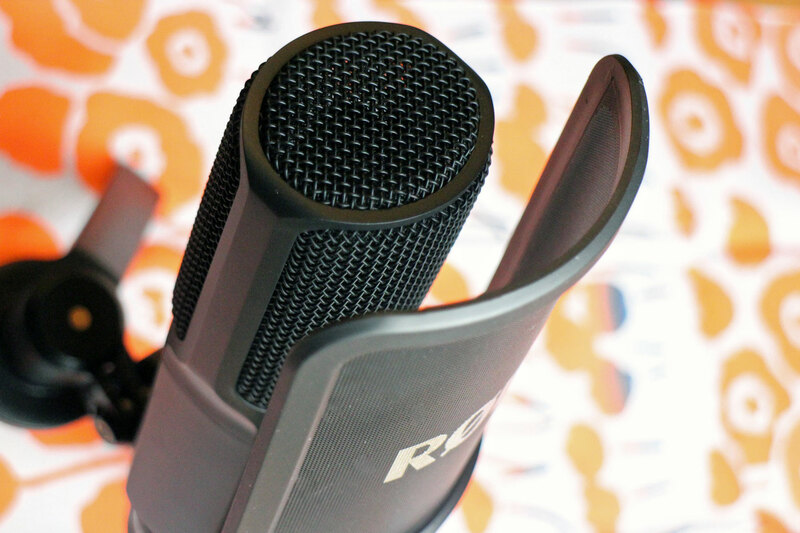 Ok, it is just a little silicone but still – considering how „eco militant“ RMS founder Rose-Marie Smith is on Instagram and other social media sites I find it a bit surprising. However, I still bought the Peach MultEYEtasker because the stick form is so convenient (and sometimes a pot highlighter is impractical). I’m using the highlighter to accent my cheekbones and I’m wearing it as an eyeliner too – it looks very summery! The colour is a shimmery, light rosé which lasts well. The twist-up pencil design works well and looks elegant. The stick is available offline and online, for example at Amazingy, Content Beauty or Green Glam. Finally the Sun Stick from French brand Alga Maris is available in a tinted variant! 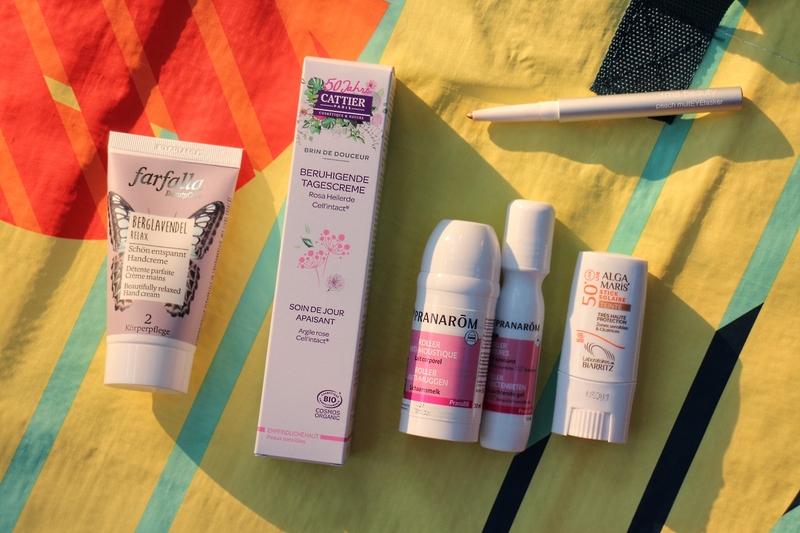 In Southern or tropical regions I like to supplement my regular sun protection cream with a sun block that I apply to exposed areas of my face, so I simply had to get the Tinted Sun Stick SPF 50 from Alga Maris (I bought the stick at Amazingy). The colour is a light „medium“ with neutral to cool undertones. The texture is not too thick so it’s easy to blend – it feels more like a foundation stick, in fact! The Stick Solaire is based on processed plant oils followed by the two mineral sun filters zinc oxide and titanium dioxide, and beeswax. This kind of high SPF sun block is particularly good for areas of the skin that need special protection from the sun, like scar tissue or hyperpigmentation. Berlin beauty brand Und Gretel is launching a new Tagarot Lipstick in shade 07 Love Berry this month. More information is available here. German organic brand Lavera has brought out six Matt’n stay Lips in pencil form. For further information click here. Have a good weekend everyone! I am soon leaving the Cévennes area and travelling into Nothern Provence. In cooperation with Dr. Hauschka // „It’s not about looking ever young, but about looking ever better“ – this perfectly sums up what I think about ageing and growing older in general. I actually found this sentence on the packaging of the recently launched Regeneration Day Cream Complexion from German brand Dr. Hauschka. Over the last few weeks I thoroughly tested the new day cream but also thought a lot about the topic of beauty – what does it mean exactly, „to look ever better“? I am often surprised by the superficial way that our modern society uses the term „beauty“ – especially when it is applied to women. Females are usually considered beautiful when they are young and thin, with (ideally) light-complexioned skin and long, thick hair. Yet all of these descriptions of „beauty“ only refer to the visual layer, the external perception of a person – and this can quickly become boring! Yes, we all know that true beauty comes from the inside and so on, and although this sentiment is a bit of a platitude there is an important kernel of truth to it. Beauty can only be experienced with all five senses. Merely perceiving it with your eyes is not enough. But what is the best way to describe this other non-visual and intangible „beauty“? I am finding it surprisingly difficult to describe what it is that makes a person really beautiful (beautiful beyond the external shell, I mean). I think there is a kind of energy which can be felt rather than seen. This energy connects body and spirit and if the energy is vibrant enough it can result in an inspiring and beautiful person. However, since this connection between body and spirit cannot be measured or quantified, our modern technocratic society does not place any particular importance on this indefinable spark. Although this might be changing slowly. Take the current trend towards yoga and meditation, for example: it seems to indicate that an increasing number of people are trying to transcend our usual materialistic worldview. But even here some individuals focus on external perception rather than inner beauty – you probably know what I mean (they’re the ones trying to post the perfectly composed meditation shot or the most spectacular yoga pose on Instagram 😉 ) . Finally my thoughts about this „better“ kind of beauty led me to the world of art. With art I mean art in the widest sense: not just the visual arts but also poetry and music and our own imagination, the creativity that lives in every human being. If you don’t cherish these wild (and often unruly) energies and impulses – or you try to repress them – your worldview will automatically become more narrow. And you will end up stuck in the superficial concept of beauty. This would be such a loss: to you and to everyone else as well. When I look at myself I realise how happy it makes me to live in my own fantastical and imaginative world. It makes me happy to dream and to free myself from emotional restrictions and patterns. At the same time my focus moves away from rigid ideals of beauty and automatically expands towards a deeper kind of beauty (and this beauty is outwardly perceptible, by the way). Yes, I know; this sounds super romantic and that’s probably what it is! But hey, sometimes you just need a dose of romaticism and I personally have decided that in future I will give my creativity free rein, letting it roam and then seeing what happens. I want to „function“ less and instead read more inspiring books and poems, visit museums and galleries and listen to music; making my heart and soul feel more alive. My imagination nourishes my inner beauty which is closely connected to outer beauty. And the best thing is that no one can take this special creative energy away from me. The older I’m becoming the larger my creativity will become. And it will be completely independent from external notions of what constitutes „beauty“. After this excursion into the world of philosophy let’s circle back to cosmetics! 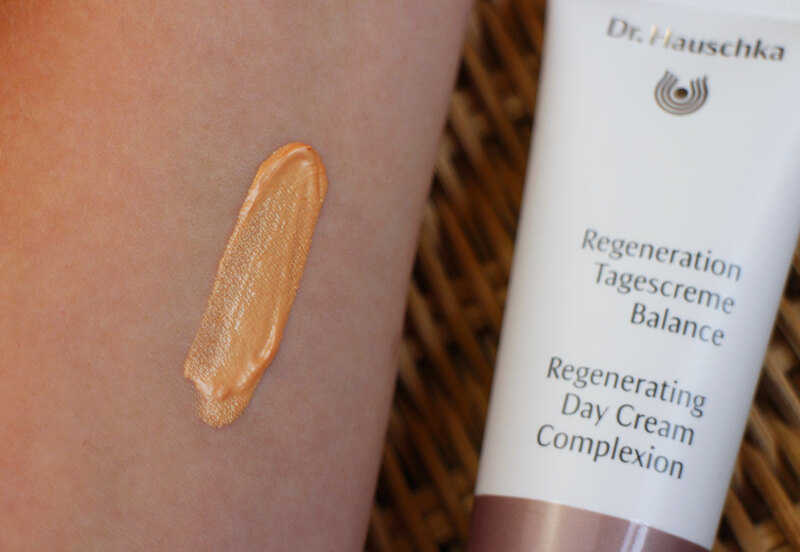 Dr. Hauschka launched the Regeneration Day Cream Complexion in early September as a line extension in the Regeneration line for mature skin. The Regeneration range now includes nine products. Initially I was a bit surprised by this new product; I hadn’t really expected another tinted day cream in Dr. Hauschka’s product portfolio. 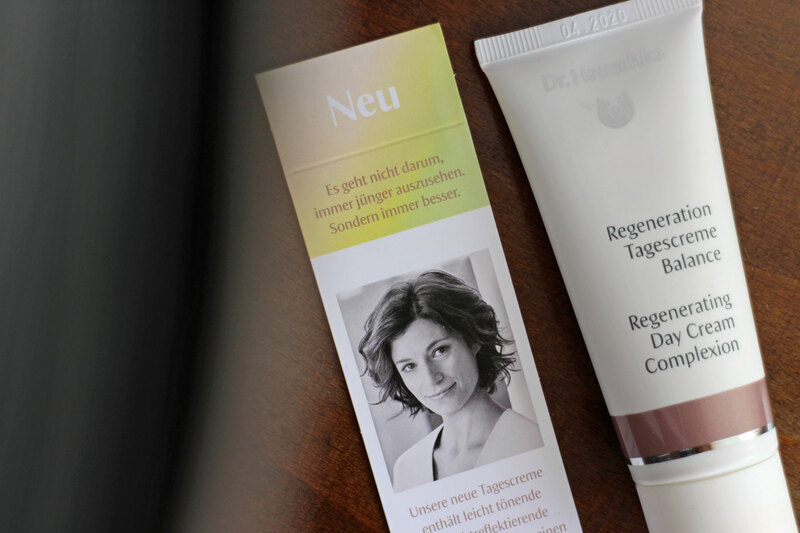 However, the Regeneration Day Cream Complexion is very different from Dr. Hauschka’s classic Tinted Day Cream. When I applied the Regeneration Day Cream Complexion for the first time I was amazed by how natural and glowing my skin appeared: the cream doesn’t cover up the skin but evens it out very effectively. The tinted day cream resulted in a very natural glow without being shimmery and shiny. Dr. Hauschka’s R&D department told me that this was due to the special selection of super fine pigments. These colour pigments subtly reflect the light on the skin: yellow-golden and green pigments make the skin appear glowing and neutralise redness whiler red pigments even out darker patches (like the shadows underneath your eyes). The Regeneration Day Cream Complexion also made me realise how important the selection and combination of colour pigments is in a tinted day cream (or in a foundation or powder). On the picture above you can see a compact swatch of the Regeneration Day Cream Complexion – don’t be fooled by the solid colour. Because of the special pigmentation the colour adapts itself to different skin tones. Light reflection is more important than coverage! Unless you have very light skin the Day Cream Complexion should be a good match. On my light to medium toned complexion the cream almost disappears into the skin but the effect is still very visible. My complexion looks more even-toned and red patches are visually minimised. The light effect on the skin looks almost impressionistic 😉 . The texture of the Regeneration Day Cream Complexion is light and fluid; it is easy to apply and even feels a bit refreshing on the skin. In summer time the cream is moisturising enough for me to wear it solo (my skin is on the dry side) or with a serum underneath for an extra boost of hydration. Once the temperatures turn colder I’ll probably have to apply a day cream or a face oil underneath the cream. I think that the Regeneration Day Cream Complexion should be suitable for combination skin but also for drier skin types. 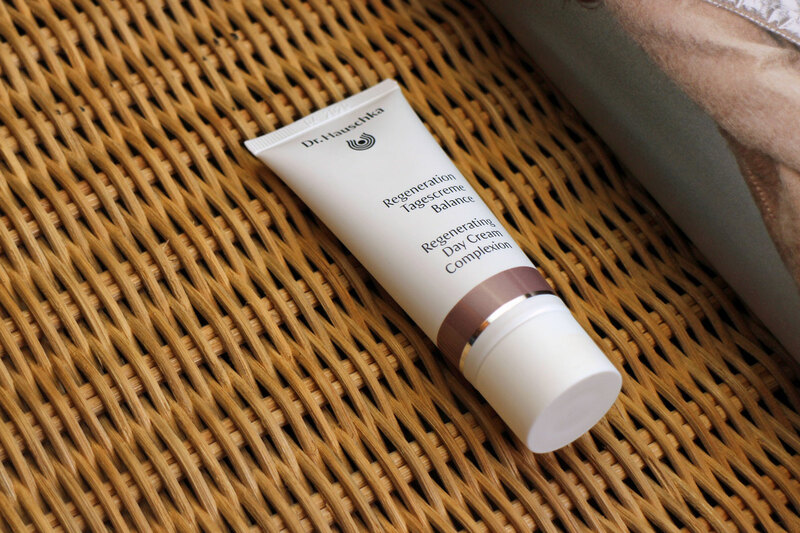 Compared to the Regeneration Cream, Dr. Hauschka’s classic Tinted Day Cream has a richer texture. The Regeneration Day Cream Complexion contains a blend of plant oils including jojoba oil, almond oil, olive oil, shea butter and raspberry seed oil. The alcohol content is low. Besides moisturising glycerin the formula also contains extracts of red clover (which contains isoflavones), bryophyllum (stores moisture), acerola (vitamin C) and horsetail (contains a lot of silica and boosts the skin’s metabolism). The Regeneration Day Cream Complexion plumps up small wrinkles so that the skin looks smoother. The fragrance of the Regeneration Day Cream Complexion deserves special mention: when I apply the cream I smell notes of frankincense, dried herbs, a bit of spices and sandalwood – it is a rather adult and almost spiritual fragrance that probably wouldn’t have appealed to my teenage self … but as a 40+ year old woman the scent seems to give me a sense of where life might take me. I am more than fascinated! However, the fragrance evaporates quickly so it doesn’t linger. And with this extraordinary fragrance I’m circling back to my thoughts about beauty that I talked about in the first paragraph of this text. A holistic, enveloping beauty is not confined to the visual plane. Instead it is a vibrant connection between body and spirit: just like the light-reflecting pigments and the complex, unusual fragrance work together to make the Regeneration Day Cream Complexion into a beautifully well-rounded face care product. More information (including INCIs) are available on the international homepage of Dr. Hauschka. A tube of Regeneration Day Cream Complexion contains 40 ml and costs 48 Euro. The product is available in all official Dr. Hauschka stockists, including organic supermarkets, department stores, pharmacies and online shops.